Another week, another solar power efficiency record set! 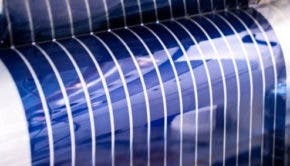 A California-based manufacturer of flexible thin-film solar cells and solar panels, SoloPower, yesterday announced a record aperture area efficiency for flexible copper, indium, gallium and (di)selenide (“CIGS”) modules — 13.4%. The National Renewable Energy Laboratory (NREL) independently certified the record efficiency. These solar panels also “require less balance-of-system hardware and are easier to install than traditional solar panels,” the company notes. Of course, the solar panel industry is highly competitive and different technologies using different materials and manufacturing equipment are all vying for their seat in the sun. As I just wrote about an hour ago, a newly unstealthed solar-manufacturing-equipment startup has found a way to cut the cost of silicon solar wafers in half! SoloPower, though, thinks it’s going somewhere and is now hiring technicians and engineers for its new high-volume manufacturing facility in Portland, Oregon. SoloPower intends to start commercial production of its solar cells and panels there by the end of the year. Eventually, it projects the manufacturing facility will have a capacity of 400 MW and will employ 450 people. June 2006: SoloPower raises Series A financing based upon success of initial R&D results. The financing was led by Crosslink Capital and Firsthand Capital Management. December 2006: SoloPower begins building its pilot manufacturing line. June 2007: SoloPower gets selected by the United States Department of Energy (DOE) to participate in the Solar America Initiative (SAI) Incubator Program. July 2007: SoloPower raises Series B financing led by Convexa Capital and Alf Bjørseth, co-founder of REC Group. October 2007: SoloPower negotiates a contract with the DOE and initiates work on the prestigious SAI Incubator Program. January 2008: SoloPower relocates to its new 109,000 sq. ft. state-of-the-art manufacturing facility in south San Jose and begins to ramp up its 20MW+ manufacturing plant. September 2008: SoloPower raises Series C financing led by Hudson Clean Energy Partners.